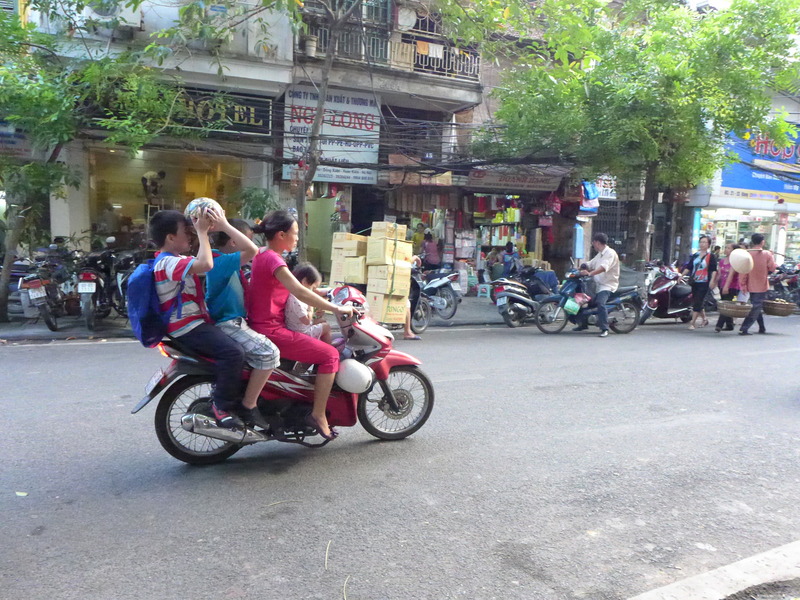 We did a 4-hour turnaround in Hanoi after our Ha Long Bay experience. 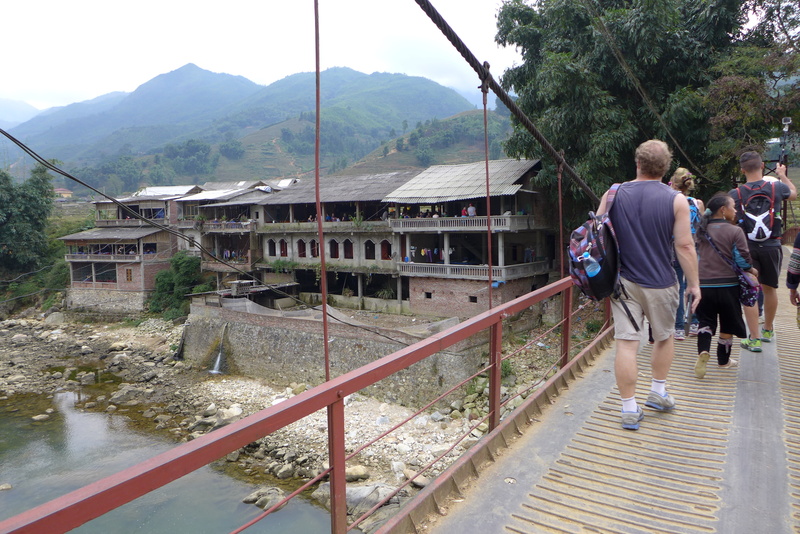 It was a whirlwind but saved us a night in a hotel since we were on the overnight train to Sapa. Unfortunately, it was not the idyllic, restful train ride we were expecting. 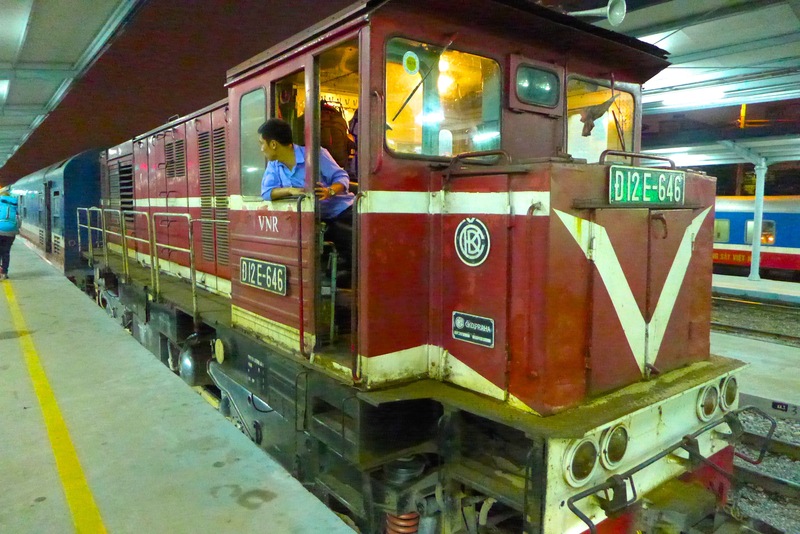 Our ancient, rattly, bumpy train to Sapa. And too late, we heard that there is a new road from Hanoi and you can take a brand new sleeper bus with Wi-Fi for $15 each way!!!! We paid $45 each way. OOOOOh the agony! We didn’t sleep AND we paid $60 too much. We got there kind of grumpy and had to make a 6am transfer. Our mini-van was there to pick us up but we waited for an hour until the next train came in. Lesson learned. Take the bus. 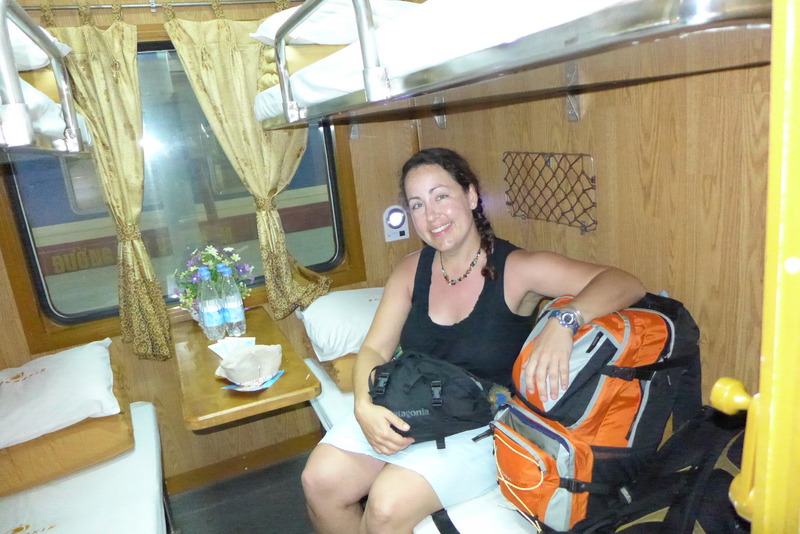 Me, hopeful that our train ride to Sapa, Vietnam is as restful as the ride from Hue to Hanoi. We were pleasantly surprised when we finally arrived at the Hoa Phong Hotel in Sapa. We took a shower, dropped off our stuff and got ready for our 5-hour hike to our homestay in the rice terraces. 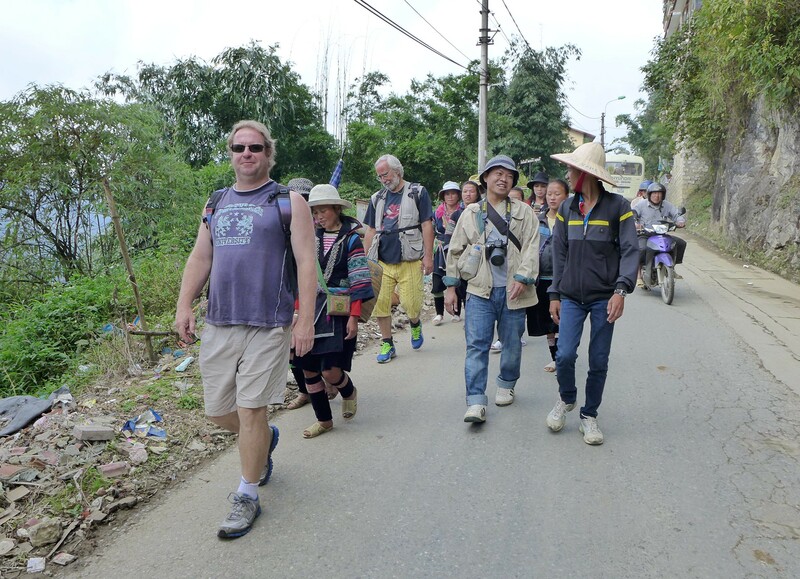 This is how our hike started, tourists, guides and local women- lead by Troy! Since the ‘road’ gently sloped downhill, the 5-hour walk wasn’t that strenuous. 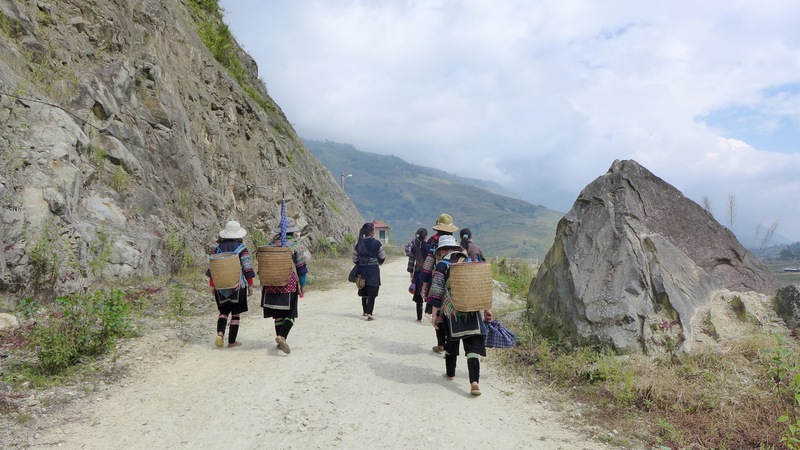 We were joined by a group of women returning home from the early morning market in Sapa. Just as we were starting to get hungry for lunch, we arrived at our destination. Yep, the upper balcony of that ramshackle building is our lunch restaurant. There is a pig pen directly below. Our guide had to shoo them away. He was quite angry that the little girls were not in school and he forbade us to buy anything from them. 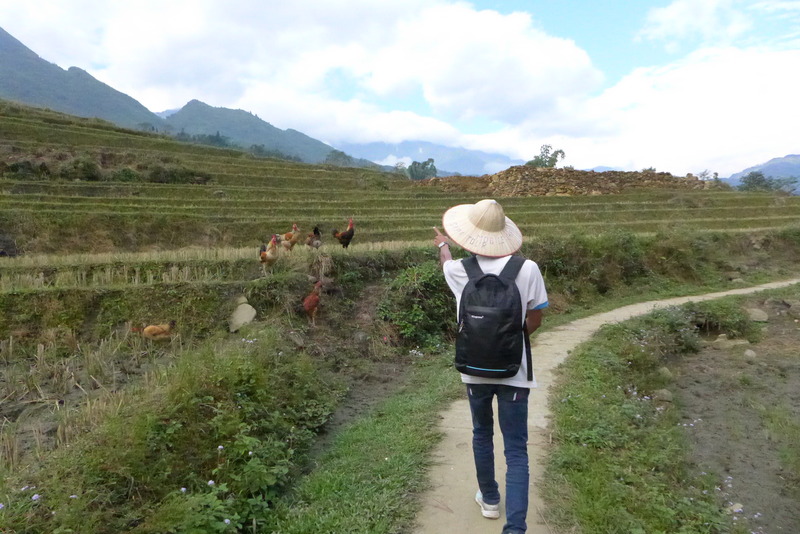 We hike another hour or so, through the terraced farmland to our homestay. Read my next post to find out about our homestay!